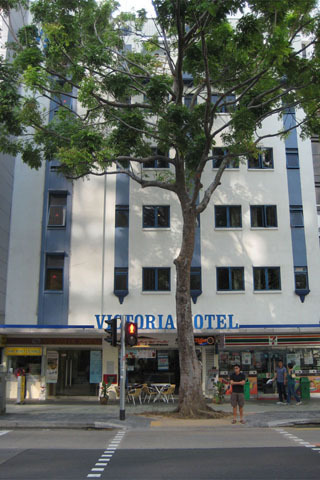 The Victoria Hotel offers everything you could ask for in a budget hotel — clean rooms, helpful staff, free WiFi, and there are a bunch of cheap places to eat within a short distance. For the standard and the price, rooms are of a good size. They’re perhaps a bit pastel and about twenty years behind the cutting edge in hotel decor, but the beds are comfortable, the water is hot and the air-con iced. Our rooms came with a comfortable desk to work at and while we had no view to speak of aside from a wall, there was still enough light coming in. Given the location on the busy Victoria Road, rooms are quiet. Facilities include free WiFi, kettle with coffee and tea and a minibar. As a bit of a breakout for Singapore hotels at this price point, there is a TV and it includes channels you may actually want to watch! The location is excellent. You’re just a few minutes from City Hall SMRT and Bras Basah SMRT, the Singapore Art Museum is just around the corner and the National Museum is ten minutes away on foot. If you want a hotel with more character, if more downmarket, the South East Asia Hotel is nearby and worth a look, while the rooms at the Big Hotel are smarter, they’re certainly smaller than here. Overall a comfortable very central choice. Shop online for a discounted price as the walk-in rates are well overpriced. The Victoria is managed by the Santa Grand group -- we’ve tried a few of them, and we liked this one the best. Check rates at Victoria Hotel on Booking.com.